Wbranch has attached these 10 pictures. The message is below. 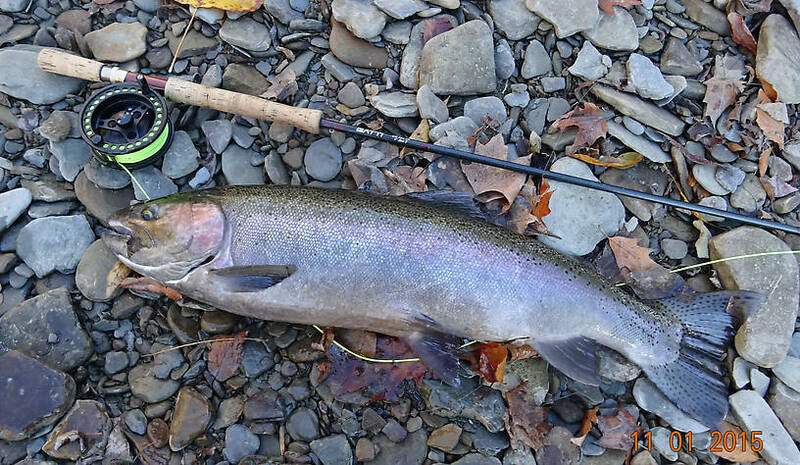 Big ugly late November steelhead about 27". 28" dark Hen caught about an hour after the 27" male above. What an awesome day! 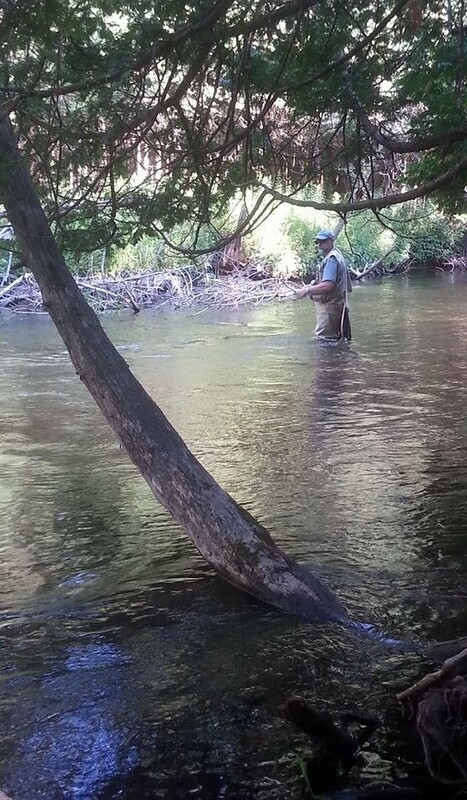 Both fish put me way into the backing and I had to chase them down river. Both were landed about 100 yards from where they were hooked. Like to give me a freaking heart attack. 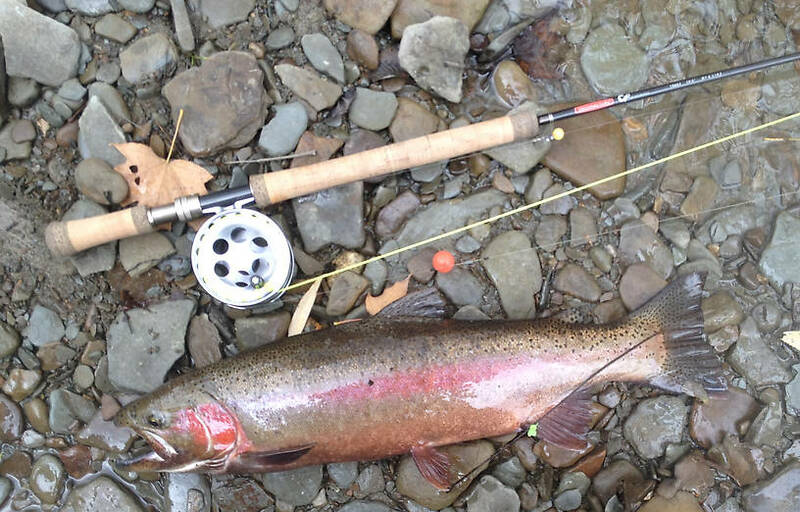 Lovely colored mid October steelhead. Was surprised it was so colorful for so early in the season. 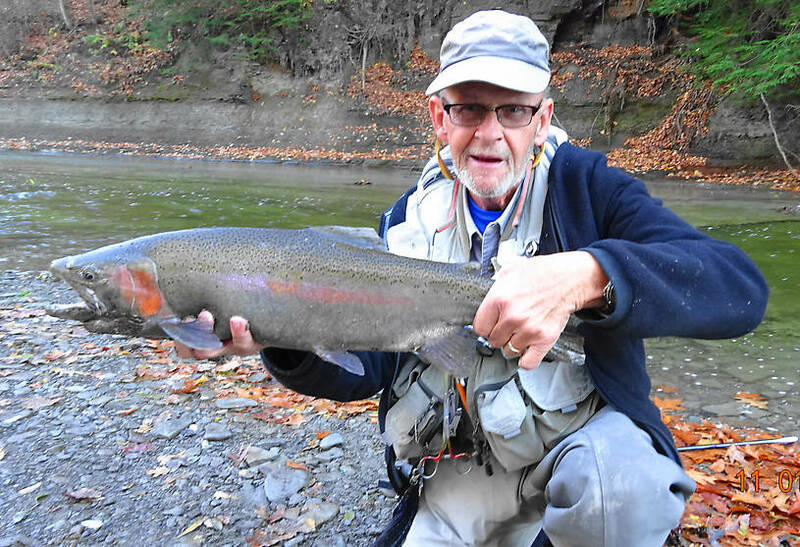 Posts: 2468 Here are various colored steelhead - all caught in the Lake Erie tribs except for the one I'm gilling which I believe is a resident rainbow. 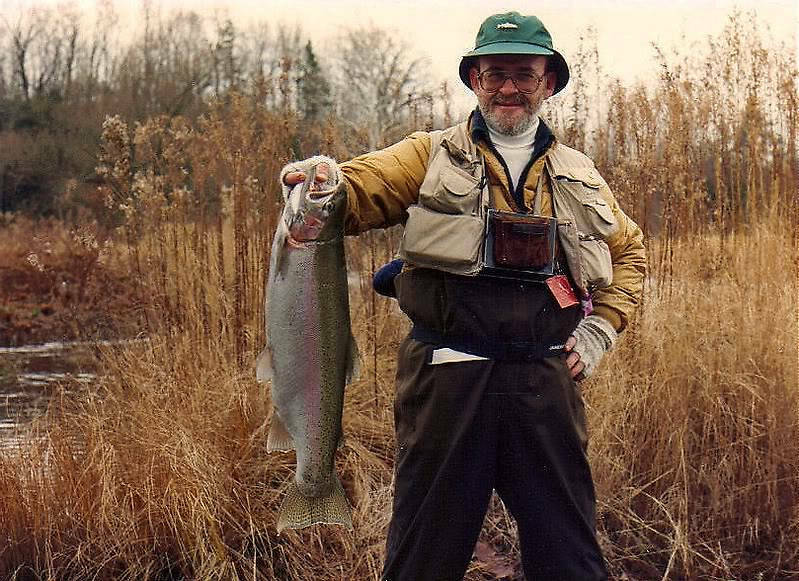 I caught it in the Salmon River in NYS before I knew how to properly hold a fish I was going to release. As it turned out the guy I was with owned a fly shop and he wanted to mount the fish and put it in his shop. 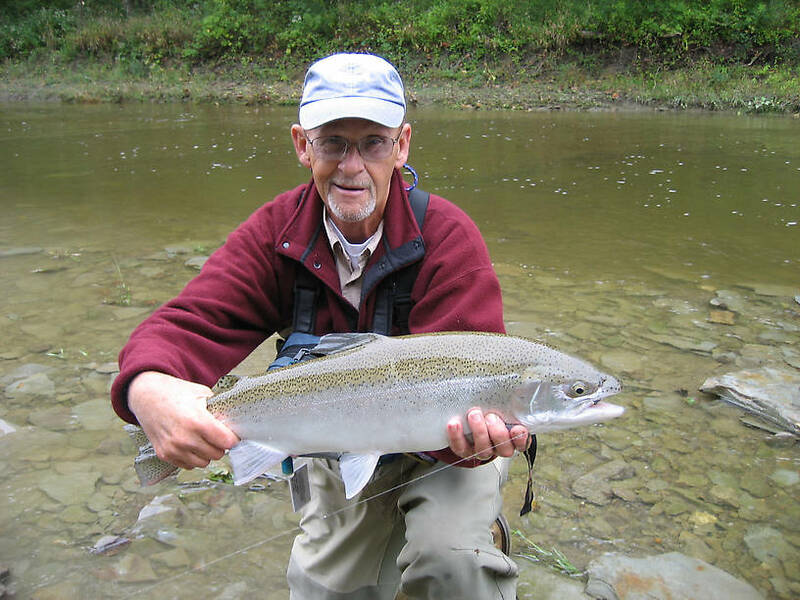 So you can see from the pictures that Great Lakes steelhead come in many sizes and color variations. Hey but they are all good! Nice pics and NICE fish! 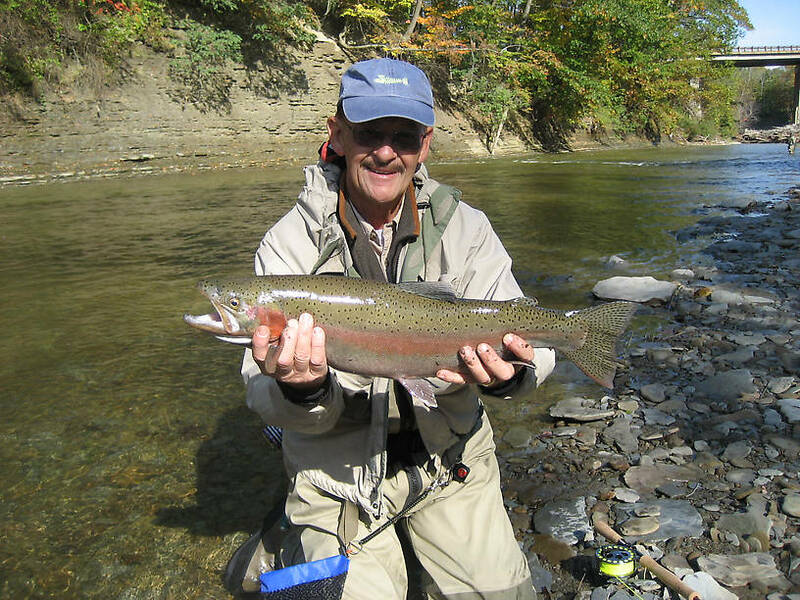 The steelhead I saw resembled the 'resident rainbow' fish in your pics, although with a much darker green-to-black dorsal coloration. Easy to see why they're called Rainbow Trout, though. 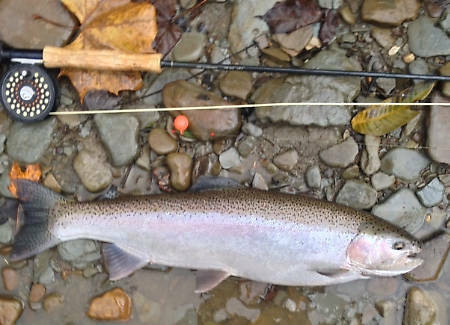 Posts: 2468 Often resident, non steelhead, rainbows are shorter and have more full and robust bodies for their length. At least that is what I have seen in the few rivers I have fished. Posts: 209 Matt, great pictures! 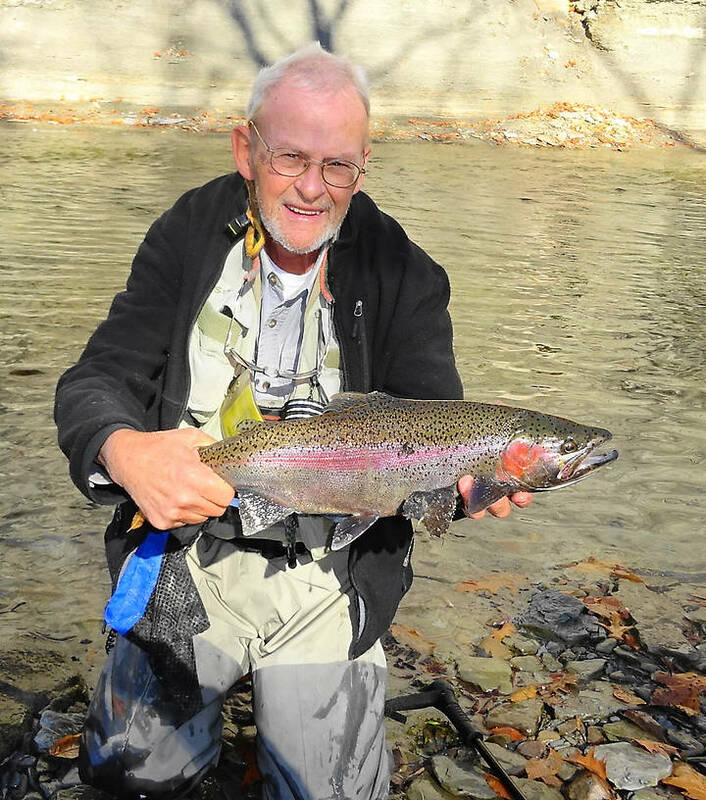 While it has been many years since I have steelhead fished, I did catch a few what I belived to be resident rainbows and browns below Foote dam that were shaped just like footballs. 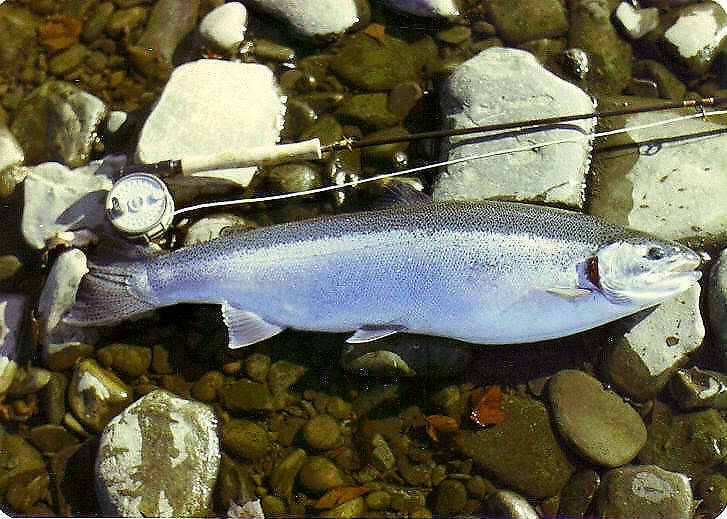 The brightest steelhead I ever caught was in the early fall, probalbly following the salmon up as they spawned. 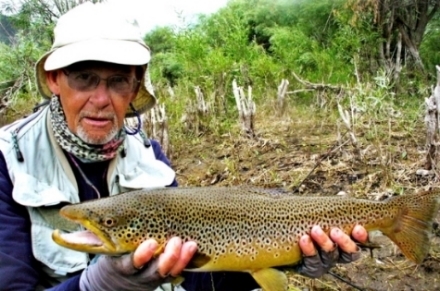 That very first silver hen is really a big fish. It is 29" from the end of the rod to the stripper guide and the tail of that fish is at least an inch past the end of the rod. 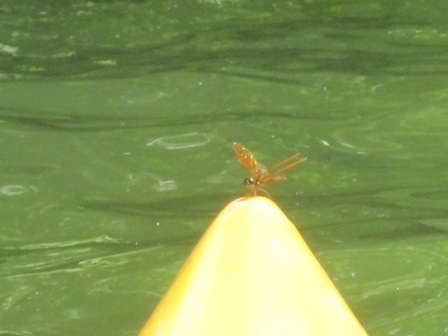 I caught that fish in a shallow riffle no more than 12" deep on a #10 brown stonefly with a yellow body. You can just see the fly in the hook keeper. She was an awesome fish and fought bravely. What reel is that in the first pic? In fact, you have quite a variety of reels there that you have used over the years. For years I have been looking for a spare spool for my Marryat MR8.5. Last year at my clubs garage sale I was walking along looking at all the stuff guys were trying to sell, and there was a spare spool! Only thing was he also had a reel and wanted to sell them all together...I bought them. Back when I bought mine, in the 90's sometime, I bought it off a local guy whose shop was unfortunately going under. I took it up to Rusty and asked him if he could swap it out for me. He said yes and opened it up right there on the counter in the shop with all the ball bearings lying on the glass counter. He then looked up and proclaimed to everyone in the shop, "What should I do with a guy who buys a reel mail order and then asks me to swap it out for him?! I should just brush these ball bearings off onto the floor and into the carpet, never to be seen again! "...I yelled, "No! No! Honest Rusty...I bought it off a guy going under!" I told him the guys name and he knew him and gave me a wink...I think the whole thing was for show. That was pre cell phones, or online shopping, and poor Rusty would be pulling his hair out now under these conditions. That is a reel I bought from Orvis back around 1983. It is engraved on the housing side "Featherweight SSS". 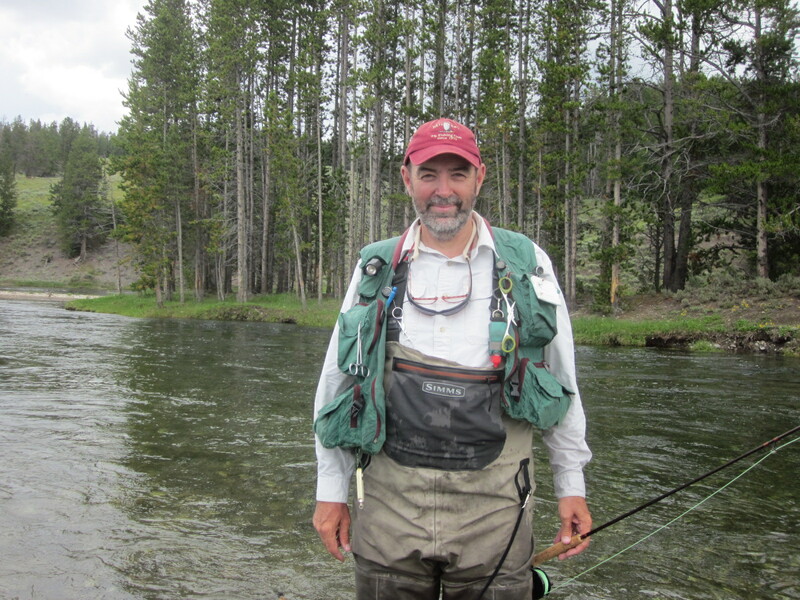 The SSS stood for "Salmon, Steelhead, Saltwater". I use it for steelhead and smallmouth. At the time, at almost $300, it was the most expensive fly reel I had ever purchased. I load it with a WF #7 floater and 100 yards of 20# backing. It was a unique drag. It is hard to explain how the drag functions except to say the drag control is on a detent track located between the width of the spool. Additional drag can be employed by applying manual pressure to a textured rubber pad on the drag control. I'll try and locate a picture of the drag mechanism. Found it! Here is a link to some ad copy for that reel with many pictures and a couple with close ups of the drag control feature and a picture of the housing with the spool removed. You can see the manner in which the drag spring engages a ratchet on the periphery of the reel housing. The reel came with extra drag parts in case the original components wore out. The next reel is a Lamson Litespeed #2 in a steel blue anodize. It was a special color only available to pro guides. I bought in used on Ebay. I sold it last summer for $175 reel and backing, no line. I bought another Lamson but a Speedster #1.5 with a narrow spool and for trout. It is a $310 reel and I bought it new, on a Ebay auction, for $225. The next reel is a Hardy disc drag model. Probably one of their first forays into disc drags. I bought it about twenty years ago and use it only for steelhead and streamer work. It had a Lee Wulff TT #5 line on it. The last reel is an Orvis LA #3 reel. It was their first large arbor reel. It cost about $180 and I have an extra spool with it. Both #7 lines, one a floater and the other a sink tip. 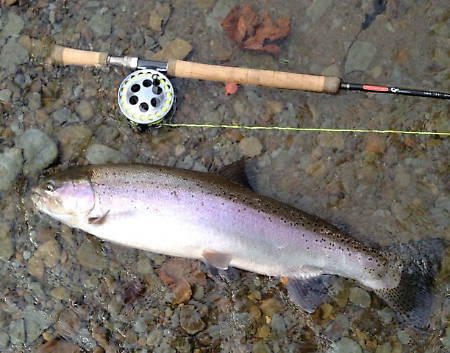 Another steelhead and bass reel. 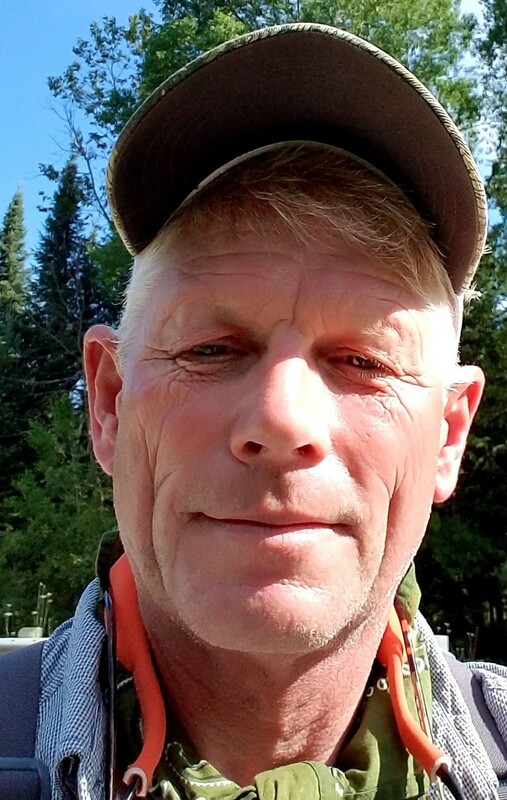 I probably have another dozen Hardy Lightweight series reels, another Lamson Litespeed #1.5, a little Teton reel with a DT #4, and a couple of salt water reels. Posts: 2587 Interesting Matt...Not sure I ever saw one of those reels...Do you know if Orvis made their own or did they employ someone like Hardy to manufacture their reels? ...Do you know if Orvis made their own or did they employ someone like Hardy to manufacture their reels? To the best of my knowledge Orvis never manufactured any fly reels but they did make all of the bamboo rods. I don't know if they are still making any cane rods but I do know the Helios & Recon rods are made in-house but the lesser priced rods are most likely made off shore. Re: I lost a MONSTER trout!